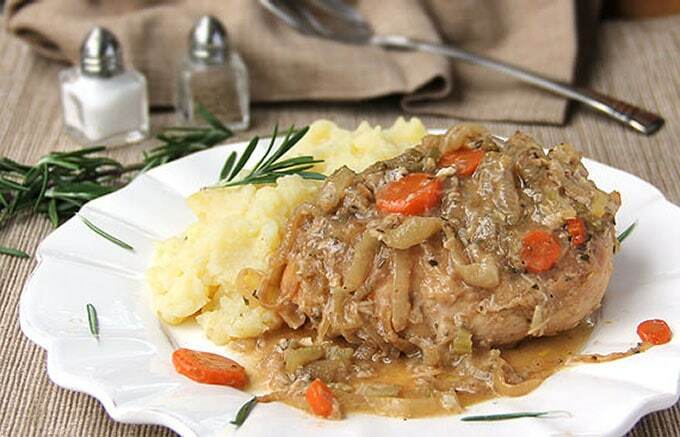 Smothered Chicken with Vinegar: chicken is topped with sautéed with celery, onions and carrots, and braised in rosemary and garlic scented vinegar sauce until it’s falling-apart-tender. Serve over mashed potatoes to soak up all the delicious sauce. If you’ve never smothered chicken, you really must. 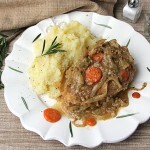 Smothered chicken with vinegar combines two of my favorite chicken recipes into one luscious, fall-off-the-bone dish. 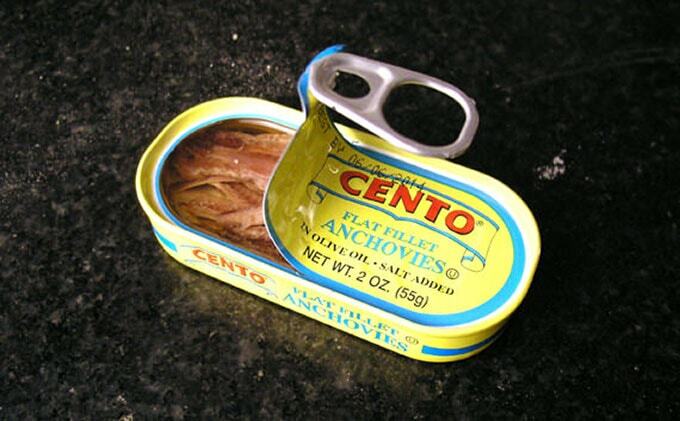 Let’s put it on the table about anchovies. They are not universally beloved. I’ve actually seen people shudder at the sight of them. Admittedly, I’m one of those people who doesn’t like whole anchovy filets staring at me from the top of my Caesar salad. But over the years I’ve come to appreciate their powerful flavor-enhancing properties. Anchovies are a wonderful, magical secret ingredient in cooking – secret because you don’t have to see them or even know that they are present, but you’re likely to be wowed by the way they bring out the savory flavor, known as “umami,” in a recipe. I think you’ll enjoy the incredible aroma that fills the kitchen when you sauté the rosemary, garlic and anchovies. It’s memorable. Oh, and one more important note – this dish cries out for mashed potatoes or rice to soak up the delicious gravy. If you try this recipe I hope you’ll come back to leave rating and a review and let me know what you think. 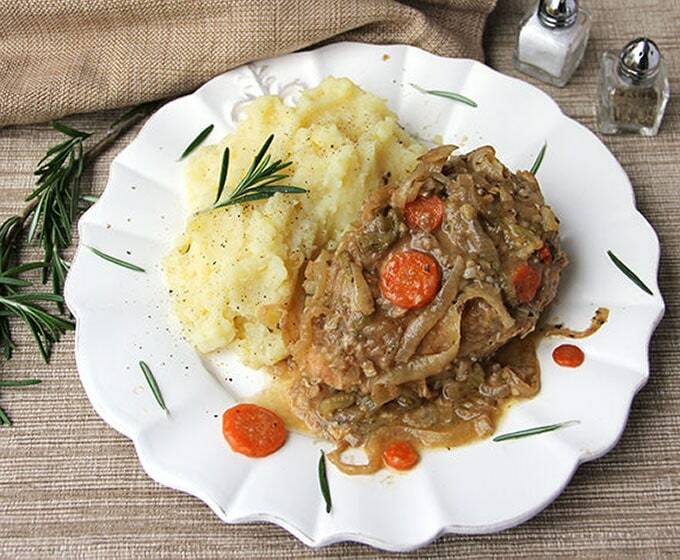 The most fall-off-the-bone tender chicken, smothered with vegetables and flavorful rosemary, vinegar garlic sauce. Brown the chicken Preheat oven to 350ºF. Put seasoned flour in a large plastic ziplock bag. Add chicken pieces. Close the bag and shake vigorously to coat chicken. 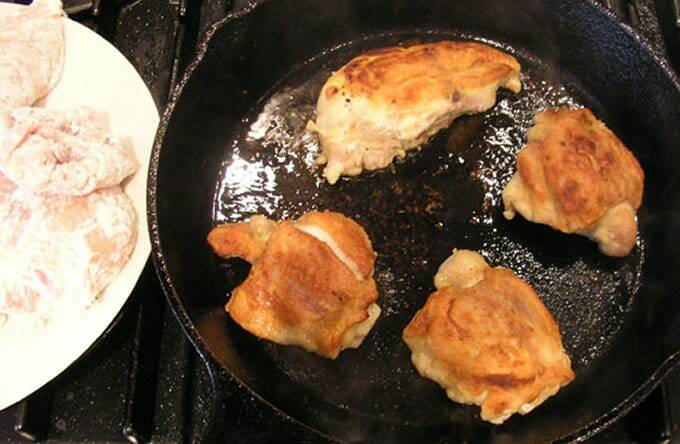 Heat 3 tablespoons oil in a large non-stick or cast iron skillet over medium heat, until hot. Shake off excess flour and brown the chicken 4-5 pieces at time for about 3 minutes per side, until they are golden brown. Add more oil, if needed. (regulate the heat so the flour doesn’t burn) Transfer browned pieces to a heavy casserole or dutch oven with a lid. Sprinkle browned chicken with 1/2 teaspoon of salt and a few grinds of black pepper. Sauté the aromatics Pour off fat from the skillet and wipe it out or wash it, so there is no flour residue. Return the skillet to the stove and heat 2 tablespoons of olive oil over medium heat. Add the anchovies, garlic, and rosemary and cook, stirring, for a minute or so until the garlic is fragrant. Scrape the mixture into a small bowl and set aside. Heat 2 tablespoons of olive oil in the same skillet. Add celery, onions and carrots. Cook for 10-12 minutes over medium heat, stirring from time to time, until the vegetables are soft and starting to brown. Turn off heat. Return anchovy mixture to the skillet and stir to combine with the vegetables. Spoon contents of skillet evenly over the browned chicken in the large pot. Combine chicken broth and vinegar in a small pot and heat just to boiling. Pour heated broth and vinegar over chicken. Cover and bake in the middle of preheated oven for 1 1/2 hours until tender. Season with salt and pepper, to taste. Serve with mashed potatoes or rice. Hi Lisa, Susan and Steve cooked this dish for us the other night…it was awesome! The meat just fell off the bone! Can’t wait to make it for our family.